WD Red 6 TB Hard Drive for NAS ( WD60EFAX ) WD Red - The new color of NAS WD Red hard drives are designed and tested for compatibility in the unique 24x7 operating environment and demanding system requirements of home and small office NAS. WD Red is designed specifically for NAS systems that have 1 to 8 drive bays. The drives are designed and extensively tested for compatibility in the unique 24x7 operating environment and for the demanding system requirements of home and small office NAS. 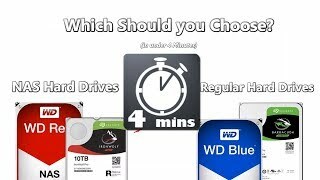 Reliability One your NAS will be constantly on you need reliable drives. This drive will be perfect for constant use with MTBF of up to 1 million hours. What is MTTR and MTBF? “Mean time between failures” or “MTBF” refers to the amount of time that elapses between one failure and the next. Cooler Operations By reducing power consumption, the operating temperature of your NAS stays cooler. In srandby or sleep mode this drive consumes only 0.7Wats. WD Red is designed specifically for NAS systems that have 1 to 8 drive bays. The drives are designed and extensively tested for compatibility in the unique 24x7 operating environment and for the demanding system requirements of home and small office NAS.